This luxurious chalet is very spacious and only minutes from the Chair lift at Le Masses, which takes you straight into the 4 valleys ski system. Brand new in 2007, finished to an extremely high standard giving a total living area 183 sq.m and parking outside the chalet. The chalet is split over 3 levels and provides generous livings areas with real fire and good sized bedrooms. A Sauna with separate shower is located in the basement which is fantastic after a days skiing. All bedrooms are en-suite and the main bedroom has a jacuzzi bath as well as a shower unit. Satellite TV and Free Wifi are available to all guests. All en-suite facilities are of a very high standard. The ground floor bedroom en-suite has a Jacuzzi bath, shower, wash basin and toilet. The upstairs en-suites have a shower, wash basin and toilet. Spacious and tastefully furnished lounge with open log burning fire and picture windows to enjoy exceptional mountain views! Fully fitted kitchen with black granite worktops, Siemens appliances, including large fridge/freezer, oven, separate microwave and dishwasher. Lots of cupboard space for food and provisions. Thyon-Les Collons is a skiers and boarders dream with access to the Four Valleys and 410km of pistes, including breathtaking descents from Mont-Fort and the world famous Piste de l’Ours, venue of 25 world cup races. The area is also an off-piste skiers dream with infinite powder to explore and a snow park for the more adventurous. Visitors can ski to Verbier in just over an hour but there is plenty of skiing and boarding to be had locally, with much less queuing. Just over 30 mins from chalet in Crans Montana, you will find The Crans Sur Sierre which is home of the Omega European Masters, voted the best golf course in the country by Severiano Ballesteros and one of the best courses I have played! Sion, situated 20 minutes from the chalet boasts a very good 18 hole golf course. Many other courses exist in summer months within 30-40 minutes drive such as Verbier, Zermatt, Luek and Seirre to name some of the best. Outside: The chalet has two large balconies at 1st floor and ground floor level and also at ground floor level is a flat garden for the kids to play in and a large patio area from which to enjoy the spectacular views and is where the table and chairs sit. Utility Room: Electric ski boot heater for 10 pairs of boots. Washing machine, sink and ironing board supplied. Cleaning / Towels / Linen / Maid service: A final cleaning charge of CHF250 is paid on arrival, when collecting the keys from Agence Les Masses (ALM). Bed linen is not included but can arranged directly with ALM. Other: A terrific sauna is situated in the basement and is large enough for the whole chalet to use. Outside facilities include garden furniture and chiminea. The views were amazing ! Beautiful location! Stunning views! Had to pinch self looking at them! Accomodation was clean and well equipped. Olivier and his wife were very helpful at check in and when we had a issue that to be resolved. Take me back to the beautiful views! The house was as advertised. Great location. We enjoyed our stay. The view in this chalet is extreamly beautiful. A few 100 meters from the skilift, which has a parkinglet. After ski we had the possibility to use a sauna, jacuzzi,... what a luxe. The chalet has lots of space. Kitchen is good equiped and as mentioned, the view from the living is amaizing!!!! I rent this chalet every year owners are really friendly and helpful chalet is amazing and to a high standard the views from the balcony are just breath taking. The management company are friendly and reliable. All in all my family always look forward to our yearly trip to paradise. Thanks for comments and glad you enjoy the chalet and views and we look forward to seeing you back next year. Once again had a lovely week in Switzerland. Love staying in this chalet. It is fantastic with all the home comforts we need. The owners Debbie and Graeme are great to deal with and I would not hesitate to recommend anyone to stay in this chalet. This is the forth time we have stayed here and look forward to going back. As always the chalet was clean and well equipped with modern, tasteful decor. The location is stunning and the views are breathtaking. Thank you for the comments and we are glad you have enjoyed the chalet and the surrounding area over the last few years and we look forward to seeing you back again. Nearest main airport is Geneva although during the winter some flights are to Sion which is only 20 minutes away. Car hire is recommended and distance to the chalet from Geneva Airport is approximately 120 miles. Travel time Geneva to Les Collons is just under 2hrs. Travel time by car from Calais is approximately 15hrs. Geneva airport to Sion by train 2hrs and trains run every 20 minutes from the airport terminal. 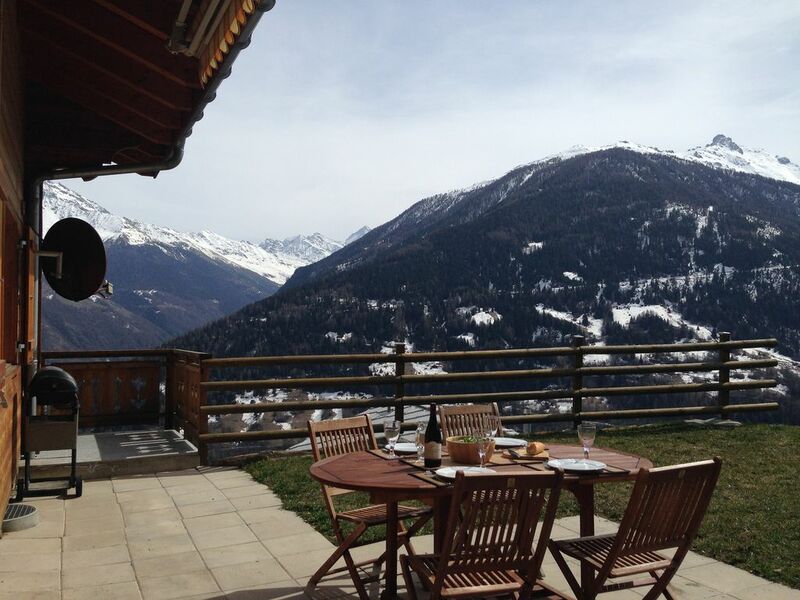 The Chalet is situated at approx 1500m between in the villages of Les Masses. The main town of Sion is 20 mins down the valley. There are plenty of places of interest to visit around Sion including vineyards, hot springs, historic buildings and many shops. The quaint villages of Vex or Hemerence are a 10 minute drive and the main village of Les Collons is about 5 minutes in a car and has many restaurants and bars. Booking Notes: We ask for a 25% deposit to secure a booking and full payment of the holiday 8 weeks prior to departure. Changeover Day: Changeover day is on a Saturday during the winter season. In the summer season we are flexible so you should contact for changes to standard changeover. Notes on prices: Arrival dates for Xmas/New Year are flexible and a longer period over New Year could be accommodated and vice-versa for Xmas.